I cannot count the number of requests I've had to film my pancake recipe. There's a particular lady that keeps sending me reminders for over 2 years now-I tried to search my inbox for her name but I can't find it. You know who you are, this recipe is dedicated to you! LOL. Heat your butter to melt if it is still tough then place in a bowl that can contain your pancake mixture. Whisk and add 4 medium eggs to the butter then mix, don't worry if it looks a bit lumpy. Add 1 cup of milk, 1/2 tablespoon of salt and then sugar to make it as sweet as you want. It's not Nigerian pancake if it does not have pepper in it oh so add as much or as little pepper as you want. Mix everything together till it is a but smooth-the little lumps are butter will melt when you make the pancakes. Heat a small frying pan and add a teaspoon of oil or spray the pan with butter. Pour in a little portion of the batter and leave for the bottom to become solid, that's when you'll know it's cooked. 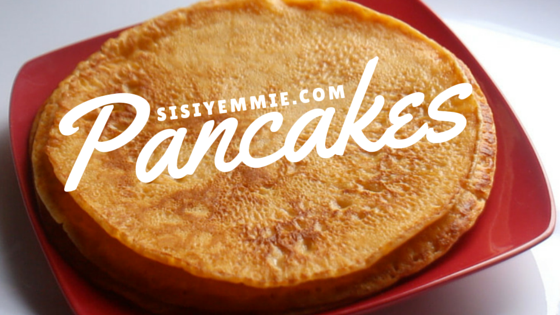 Flip the pancake to the other side, and keep flipping till you achieve your desired brownness. Thank you for this sisi. I hate eggs,if I use 2 eggs in place of 4,do you think it would stil be okay? yes, it would still be ok.
Aunty Yemi this your recipe is a must try. I haven't had Pancakes in a while so this will make me fry soon. Thank u oo. Way too much. I m trying this today buh definitely reducing the eggs. Who cares for some pancakes? These look delicious! I just may have to make them this weekend, being pregnant I am craving carbs more than ever and at least these are healthier. Is this recipe suitable for rolling vegetables as in spring rolls?